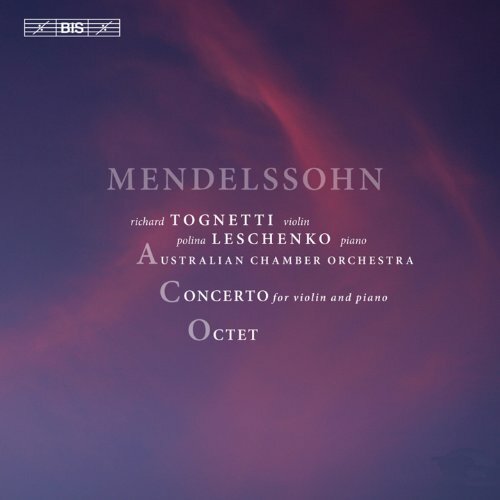 this time Mendelssohn's Octet for strings, Op.20 in in E flat major. The sample chosen is the well-known 3rd Movement, Scherzo, here edited for brevity. Basically all these recordings do repeat the opening statement, but in these samples you only hear the repeat, not the initial statement. The edit occurs within the first 2 seconds of each file, so if you hear any roughness here that's just me being clumsy, not the performers. Duration ends up around 3m30 on average, and there are 10 samples to listen to, so about 35 minutes. Mendelssohn wrote this 4-movement octet at age 16 (Arguably it was all downhill after that.) The outer movements are quite substantial and very fine, but this Scherzo is (or should be) a wispy, gossamer-like affair, pre-echoing his Midsummer Night's Dream music (Op.21). The fun is equally shared among all the musicians, with twiddly motifs being bounced around between them. It's quite interesting to listen to this music on headphones, because the various groups distribute themselves spatially in different ways. Early performances were private affairs, the first in 1825, but it wasn't publicly premiered until 1836, and the score not published until after Mendelssohn's death. Most - but not all - of these performances are HIP-influenced to greater or lesser degree. These links and files will be removed after a couple of weeks (actually I 'll be on holiday until then, so may seem a bit monosyllabic if I respond). How exciting! Until a few years ago, I hadn't ever listened to this piece. I then bought a version from Berkshire, so will be interesting to compare some different alternatives. Are you sure it isn't Hausmusik playing the Octet in that set? #1 - Lively. Resonant. Too staccato? Not always in tune. Too many inconsistencies. 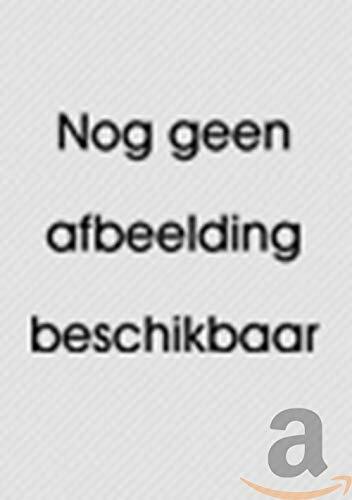 Ok.
#2 - Faster. Lighter. Fleeter. Pleasing. Better control, with some exceptions in precision of tempo. Better. #3 - Slower. Good unison and detail. I like that lead violin seems less overly prominent. Well done, even if I prefer tempo of #2. Even better. #4 - Odd sound. Hated sound of violin. Brightness has been neutered. Not enough transparency. Good unison (maybe even best so far). Too staccato. Frustrating. #5 - Better sound. Restrained sound to lead violin. Wonderful ebb and flow. Perhaps lacking dynamic difference at times. Very good. #6 - Tad slower. Similar to #5 in many ways. Same positives and negatives. #7 - Faster. Like the balance, but some lack of unison in moments (mushy). Still, pretty good. #8 - Hair faster. Good unison. A shade resonant. A couple moments of slowing.- out of place. Still - Pleasing. #9 - Another good one. Perhaps just a hair too staccato. Middle a bit weaker. #10 - Fuller sound. Well recorded in terms of hearing things clearly. Fuller at times. I liked #3 most, but #5-10 were all quite good. It was hard to order them and any of them seemed worthy. But after some repeated listening, I felt that #3, #5 and #8 stood out. #3 was perhaps the slowest, but I felt it best brought out the details and the ebb and flow. Time seemed to stop, so that was a good sign. There was a bit more legato to it in the overall movement and I liked that. I also liked the balance, but then I liked the balance of pretty much most of them, despite any differences. I utterly detested #4 though. Back now, with a proper keyboard. Of these 10, I only knew 3 versions before I assembled this comparison. They were Nos 4, 8 and 5, purchased in that order evenly spaced over a period of 40 years. (I know, last of the big spenders ) I was always very happy with #4 until I eventually bought #8 which I preferred mainly because it was a CD update to my vinyl collection, with a more detailed recording (though not the greatest, viewed in retrospect). #5 seems more overtly HIP than the other two (though all have some credentials) and has easily been my preferred version since I acquired it. So finding more recordings to add into the mix was an interesting and enjoyable exercise. I found several of them at least as enjoyable as #5 and one of them - I agree with mc ukrneal, #3 - is my new preferred version over all. Actually, the 3rd movement as presented here is the weakest part of version #3, so I'm quite surprised you picked it out on the basis of these clips. It's not perfect though - the recording isn't great and the tempi (I agree again) are generally a bit slow which can't be right in this mercurial and fidgety music. Wow. Very interesting indeed! I wasn't too bothered by the sound quality of #3, but I was concerned by picking the slowest. I also had a debate whether I could put it first because it wasn't entirely what it should be. But I found it so convincing, in and of itself, that I went with it. But the overall quality was quite high and that made listening to these quite a joy. Thanks again! No.1 was Solisti Filarmonici Italiani (2010) (CPO) Period instruments, gut strings etc. No.2 was Eder Quartet & Kreuzberger Quartet (2001(?) the Eders perhaps better known for their Shostakovich cycle. This is available very cheaply on the Apex re-issue label, and is (I think) a good, well-recorded, 'modern-style' version of the Octet, easily the fastest tempi of all ten here, but impressive ensemble even so. No.3 was l'Archibudelli including Anner Bylsma on 2nd Cello (1992) (Sony). 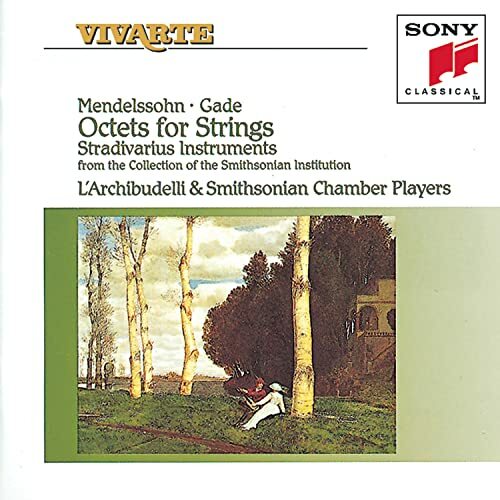 All eight instruments are Strads, according to the CD cover. Recording good but not great - but still, I like this version very much, especially in the outer movements where all the strands are very clearly delineated, maybe due to tempi on the slow side. No.4 was Academy of St Martin-in-the-Fields led by Marriner (1967) (Argo). Maybe not exactly HIP (the term didn't have much currency back in the '60s) but ASMF were certainly acknowledged as specialists in 'early-ish' (say 18thC) music. In its day this recording was hailed as a big step up from the main alternative, which as I recall was the Vienna Octet (presumably members of the VPO). Now - it sounds dire. No.6 was Ensemble Explorations including Roel Dieltiens on cello (2016(?) (Harmonia Mundi). Period instruments, etc. No.7 was Brandis Quartet & Westphal quartet (1992) (DG). I could be wrong, but I assume these are members of the BPO. This was chosen as a random representative of the many modern mainstream non-HIP versions. No.8 was Hausmusik led by Monica Huggett (1989) (EMI) Period instruments, possibly the first recording of the Octet to use this approach. 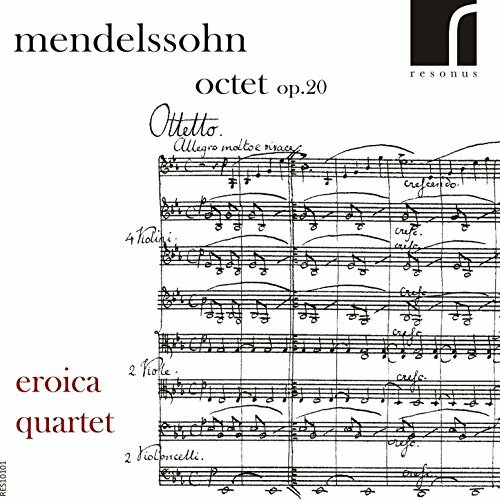 No.10 was Eroica Quartet (2011 (?) (Resonus). Period instruments. This is far and away the best-recorded of all ten versions presented here, very involving and revealing. 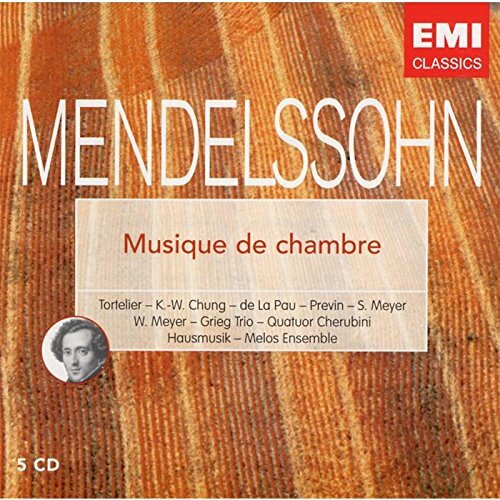 To my ears this performance is quite similar to l'Archibudelli - a bit on the slow side - but the big difference is that here we have the 'original version' (1825) of the Octet, and not the published version which included several revisions by Mendelssohn, which is what we hear in all the other nine recordings here. The revisions seem to consist mainly of cuts, in the 1st and 2nd movements and to a very small extent also in the 4th. The cuts probably are improvements, they certainly make the music more concentrated and propulsive. However there's not much wrong with the extra bits either. Some feel the Octet shows a strong Beethoven influence, I don't hear that at all myself (I probably wouldn't like the music if it reminded me of Beethoven) but this original 1825 version maybe does show more of that influence. Very interesting. I will be looking for these and to compare against the version I have (which is the Nash Ensemble). Nash are usually quite good, so I imagine it will be a good comparison. I have Hausmusik and L'Archibudelli, but none of the others. 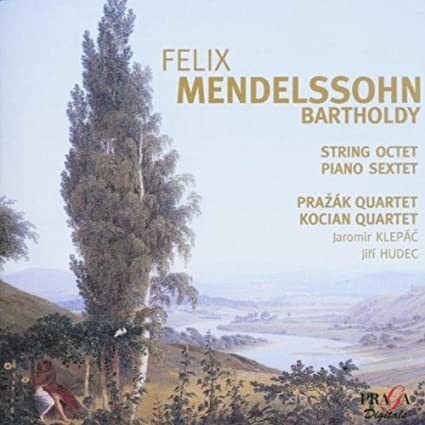 My favorite is the one done by the Emerson String Quartet, together with the Emerson String Quartet, included in their set of Mendelssohn's complete music for string quartet. Recording it involved a complex taping and overdubbing process. Tsk tsk! That reminds me, I listened to the Eder recording again yesterday, and was disturbed by quite a few clumsy edits. Their fast tempi apparently not easily sustainable. Yes I considered including the Emersons (haven't heard that one) but they got crowded out, sorry. I did not participate but I am puzzled that L'archibudelli is described as "rather slow". Among the ca. 4 recordings I have (Archibudelli, Hausmusik, Smetana/Janacek, Heifetz et al. and probably another one) it is among the fastest and most energetic. A favorite and the Gade filler is a welcome rarity. Perhaps I was subconsciously basing my assessment on the 3rd movement as presented here, and (wrongly) extending that to the whole Octet. On duration (which I know doesn't tell the whole story) l'Archibudelli are joint-slowest in this movement (tied with Ensemble Explorations), taking 40 seconds longer than the Eder quartet who were the quickest by a margin. But yes - you're right - in the Finale for example, l'Archibudelli are the quickest of all ten.